"Makes a wonderful gift for a new bride-to-be, a friend under the weather, or just to say thanks! And it tastes great, too! Decorate the jar with a fabric lid and/or a bow tied around the neck. Be sure to attach the cooking instructions to the jar." Use a canning funnel or any funnel that has about a 2-inch neck. This will make it easier to fill the jar with the ingredients. Be sure to use a wide-mouth, 1-quart canning jar. Layer ingredients in the order given: bouillon, onion flakes, split peas, small shape pasta, barley, lentils, rice, and enough tricolor spiral pasta to fill jar. Attach tag with cooking instructions: In large kettle, brown 1 pound ground beef or stew beef cut into bite-size pieces in a little olive oil. 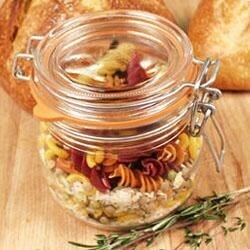 Remove tricolor pasta from top of jar and reserve. Add the rest of the jar contents to the kettle with 12 cups water. Let come to a boil and simmer 45 minutes. Add tricolor pasta and simmer 15 minutes more. Serve with your favorite bread or rolls and a tossed salad. Black lentils, bacon, and aromatic veggies make a deeply delicious soup. The nutrition for this recipe does not include ingredients not in the ingredient list, including the ground beef and olive oil. This recipe makes a pretty gift, and tastes great too! However, 18 cubes of bouillon is WAY too much. 9 or 10 is plenty. This makes the prettiest presentation in a jar! I gave this as gifts this year. I split the lentils in half and used half green lentils and half red lentils. It was beautiful.